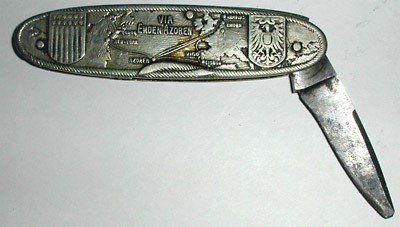 Commemorative pocket knife of the Deutsch-Atlantische Telegraphengesellschaft (German-Atlantic Telegraph Company), Cologne, Germany, featuring raised relief images and inscriptions on the case. One side bears the inscription "Deutsch-Atlantische Telegraphengesellschaft -- Köln a/Rh -- Stolkgasse 3/11," with the emblem of the 'Eagle Line' telegraph line. The reverse side shows a map of the Atlantic titled "Via Emden Azoren" and flanked by emblems of the American flag and German eagle. The telegraph line is illustrated on the map from Emden to the Azores to New York. A large and a small blade open out from the casing. The German-Atlantic Telegraph Company was established in 1900 to lay a cable to the USA via the Azores; the first section was opened on 26 May 1900 and the complete route to America on 28 August 1900. In 1903-4 the company laid a second cable over the same route, opening for traffic on 1 June 1904. The Emden portion of the earlier cable had already been in place for several years, and this line was then extended to New York in 1900. The Germans did not have full cable-making capabilities at that time, and the cable making and laying was contracted out to a British firm. By 1903 the Germans were able to make and lay the cable themselves, and with this in mind, and as the inscription on the knife reads 'Via Emden-Azoren', I believe that the knife was produced to commemorate the 1903-4 cable.